A brand name registration has confirmed the potential label for Lenovo's upcoming Windows 10 VR headset as being the Lenovo Mirage. Lenovo is just one of the manufacturers confirmed as producing mixed reality headsets for Windows 10 alongside models from Acer, Dell and HP. The designs of each of the headsets were first shown off at CES 2017. The name was confirmed by a filing with the United States Patent and Trademark Office, and spotted by the Dutch website Mobielkopen.net (via: LetsGoDigital). There's no word yet on when the device is expected to go on sale, and nor are there any firm details on price, although Lenovo has said that it expects the device to cost between $300 and $400. We do know, however, that the headsets are set to support the Xbox One platform in 2018, although it's not currently clear what form that support will take after Microsoft was notably quiet on this functionality at E3 2017. 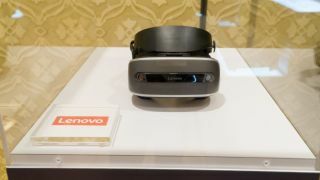 Lenovo has also announced that the headset will have a resolution of 1,440 x 1,440 and that it will weigh 350g. Although the wearable market is currently dominated by the likes of Oculus and HTC, the arrival of new entrants will be welcomed by a market desperately in need for some competition to reduce its high entry prices.